Rachael King is a Researcher (Aquatic Invertebrates) at the South Australian Museum and an Affiliate Research Fellow of the University of Adelaide’s School of Earth and Environmental Sciences. Her research focuses on aquatic invertebrate biodiversity studies, particularly the exploration of new species of crustaceans and the investigation of their evolutionary relationships. We have recently been successful in securing funding for two 3-year research projects that will provide comprehensive analyses of poorly known amphipod crustaceans; dominant members of a recently discovered and internationally significant underground fauna in the Pilbara and Yilgarn regions of Western Australia. Western Australia contains one of the world’s most diverse assemblages of stygofauna (those animals that live entirely aquatic lives within groundwater systems), with species reported from aquifers, caves and groundwater associated springs. Many invertebrates, including small crustaceans like amphipods, have been shown to be endemic to the region (i.e. not found in any other regions), with highly restricted short range distributions – many limited to single aquifers. Members of two amphipod families, the Melitidae and Paramelitidae, have been extensively collected and documented in the Pilbara, Yilgarn and the adjacent offshore Barrow Island in Western Australia, yet many of the few described genera and species remain inadequately and in some cases contentiously defined. Most are known from single borehole localities, and many were described from few specimens with only slight morphological characters to distinguish them. Recent collections and subsequent molecular evidence indicate strongly that there is a large unexamined diversity of melitid and paramelitid species yet to be described. The analyses also reveal taxonomic problems at the generic level and identify a need for comprehensive morphological revision with an emphasis on documenting variability within and between species. Over the next three years we will use modern tools, incorporating morphology and molecular data, in a comprehensive study of amphipod biodiversity, investigating evolutionary relationships and defining species boundaries. Targeted field collections and the inclusion of material from the collections of the Western Australian Museum and several active biodiversity consultancy companies will mean that species and genera will be able to be described and revised using a broad scale analysis of catchments rather than from small samples from individual bore holes. 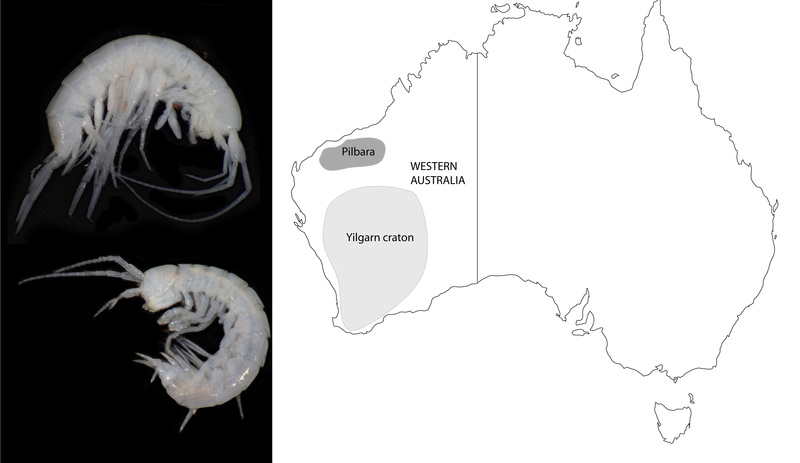 In total, it is estimated that the number of known stygobitic amphipods in Western Australia will double with 2-3 new genera, 30-50 new species described and many species revised, and an illustrated interactive key developed for species identification. Extensive mining operations as well as pastoral activities within Western Australia that heavily utilise water extracted from groundwater systems have the potential to significantly impact subterranean ecosystems. As such, it is imperative that we gain knowledge of the biodiversity and distributions of groundwater species to aid in the current management of both fauna and resources. The information gained from these projects will provide valuable data on stygobitic amphipod biodiversity and distributions that will give scientific support to informed management and conservation of groundwater systems as well as facilitating environmental impact assessments. It is hoped that the results will provide for greater understanding of the distributional ranges of stygofauna in central Western Australia, with the potential for identifying biodiversity hotspots and areas of high conservation value. Funding has been provided by the Australian Biological Resources Study and the Hermon Slade Foundation; with significant support from the South Australian Museum, The University of Adelaide (Australian Centre for Evolutionary Biology and Biodiversity and Science Faculty), Western Australian Museum and several Western Australian environmental consultancy companies (Bennelongia, Subterranean Biology and Biota). Joint investigators of these projects include Dr Steve Cooper (South Australian Museum) and Dr Bill Humphreys (Western Australian Museum). This entry was posted in News and tagged ACEBB, biodiversity, Rachael King, South Australian Museum, Western Australian Museum. Bookmark the permalink.